When thinking about "wildflowers", we should not forget the trees and shrubs. They often offer not only flowers, but food and shelter for insects and birds alike and interest across many seasons. 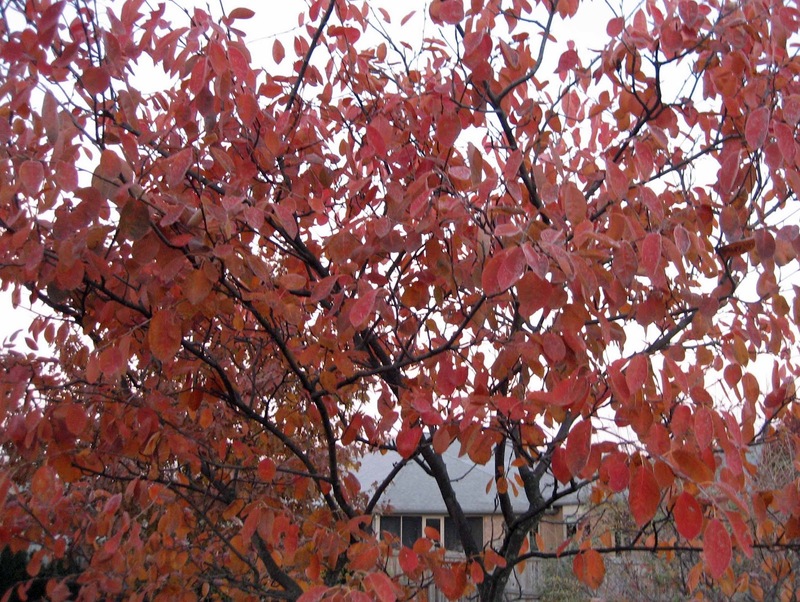 In my garden, I've planted several serviceberries, Amelanchier sp., which are members of the Roseceae family. The white blooms in early spring are not as showy as those of their relative the apple tree, but are pretty and delicate. Plus they don't stink like the blooms on those ghastly Callery pear trees that everyone insists on planting. 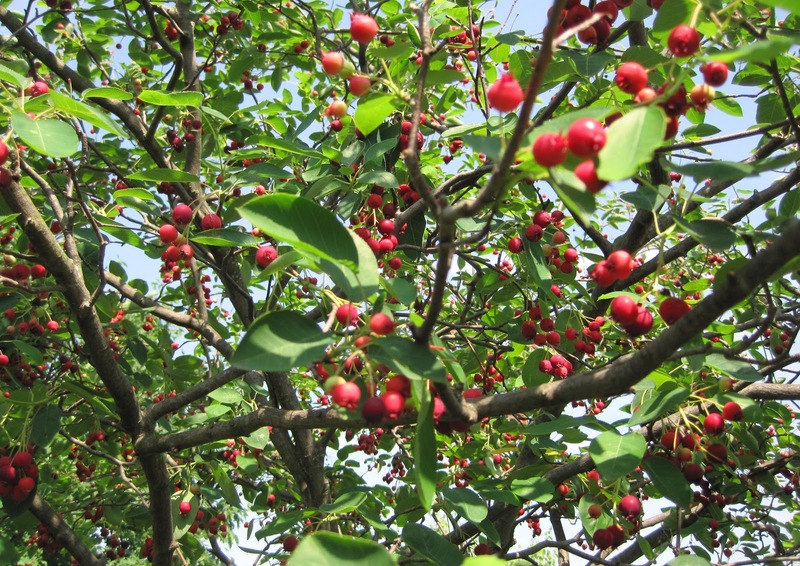 By late spring the serviceberries are covered with fruit. These tiny red "berries" are edible but it would take a lot of them to make any sort of substantial dessert or jelly. I leave them for the birds to enjoy. And they enjoy them quickly. As soon as the fruit ripens, birds swoop in and gobble them up. Throughout the summer, the foliage remains "clean and green", turning a lovely maroon color in the fall. When a plant can provide three seasons of interest and attract and feed birds, what's not to like? 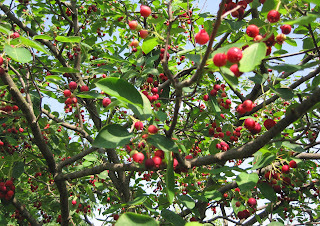 Well, you might not like that serviceberries are often grown as multi-trunk trees. If you choose to plant one with a single trunk, be prepared to cut off suckers as they form around the base of the trunk and don't expect it to tower like an oak tree. 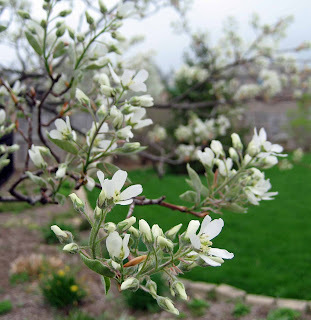 You also might not like that if you plant a serviceberry near a sidewalk or driveway, some of the fruit may drop to the ground and make a little bit of a mess. But neither is that big of a problem. Don't let them stop you from planting this in your garden. The birds will thank you for doing so. My name is Carol and I endorse serviceberries for Wildflower Wednesday, hosted by Gail at Clay and Limestone on the fourth Wednesday of the month. They are so lovely. I need to make room in my garden for one of these beauties. I love this tree and soon it will be a brilliant mix of oranges next to the purple chairs in my garden! I've never gotten to taste the berries, but, I agree completely with leaving them for the birds. I put one of these in my garden this year. I will have to wait until spring to see the wonderful blooms and looking forward to its fall color! Thanks for this endorsement, Carol. 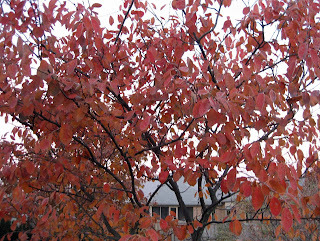 I do not grow serviceberry, but might need to consider it. I have several serviceberries but they are all the cultivar 'autumn brilliance'. i would like to plant more species. 'Autumn Brilliance' is very nice, excellent fall color as the name suggests, but I have found it to have powdery mildew at times. A lovely tree - good to look at and great for the birds. Good post. And to add to their positive attributes, as understory trees, serviceberries will grow in shade and aren't terribly fussy about culture. They take their name seriously! Serviceberries are very yummy. I bought some jam earlier this year from Canada, where serviceberries are grown commercially. The jam didn't last very long. Of course, it was from cultivars specifically bred for fruit, not the wild variety. It's not only the flowers and berries that are beautiful, the leaves as well. How do you call the wild plums, are they serviceberries too?